So this throw quilt is finished. I actually completed it a couple of weeks ago, but we seemed to have rain for two weeks straight so it was this past weekend before I could get a pic in good morning light. The back of the quilt is a green hexagon print. This is finish number 1 for the Finish Along with Adrienne at On The Windy Side. (Button in sidebar.) My original FAL post is here. I quilted it simply with straight vertical lines in the background, outline quilting for the motifs - horizontal lines in the tree. And this little dress is for the charity Dress A Girl Around The World - (a program of Hope for Women International). This is a great program that provides dresses for girls. It is a very simple pattern to make and for such a good cause. If you'd like to get involved just click on the link above and search for an ambassador in your state. 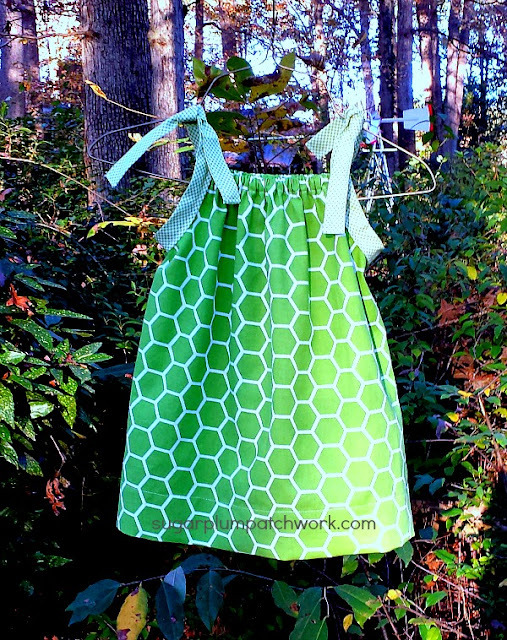 The fabric in this dress is the fabric I used for the back of the quilt - a wonderful way to put the leftovers to good use! Linking up with Needle and Thread Thursday and Finish It Up Friday. That's a cute tree - reminds me I need to find one I did several years ago in 2 1/2" squares! And the dress is wonderful, what a great cause. Just lovely. Thanks for visiting Lynn - and for your kind words. I would love to see your quilt! Your quilt is wonderful! I love that there are presents under the tree. And the print on the dress is just darling. This is a lovely Christmas quilt, nice work!! Love the Christmas quilt! Your dress is really pretty, too. Some lucky little girl is going to love getting it! Thanks Mary! Dress a Girl is a great program. I too, absolutely love this Christmas quilt!!! Love your quilt! So vibrant and fun. Thanks Pam - I do seem to be drawn to bright colors! 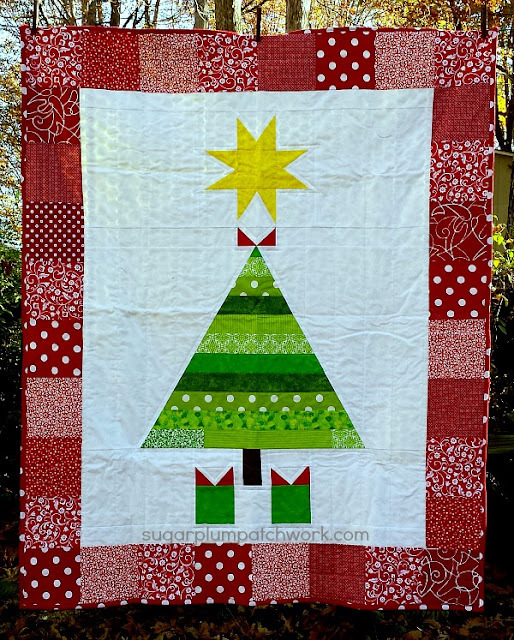 This is such a sweet Christmas quilt!